A motion filed by the prosecution Wednesday, says a possible conflict of interest could cost Delke his lawyers in the high-profile case. NASHVILLE, Tenn. (WTVF) — Decommissioned Metro police Andrew Delke pleaded not guilty to the first degree murder charge of Daniel Hambrick. A motion filed by the prosecution , specifically District Attorney General Glenn Funk, Wednesday says a possible conflict of interest could cost Delke his lawyers in the high-profile case. Delke is represented by well-known Nashville attorneys David Raybin and John Brown. They've been with him since the beginning, but NewsChannel 5 has learned about the motion asking them to recuse themselves. The defense was in court this morning for Delke's not guilty plea. He was indicted on the first degree murder charge in Hambrick's shooting death last year. The motion claims Raybin's link to the Fraternal Order of Police is a problem and it takes issue with what might happen if there is talk of a plea deal. 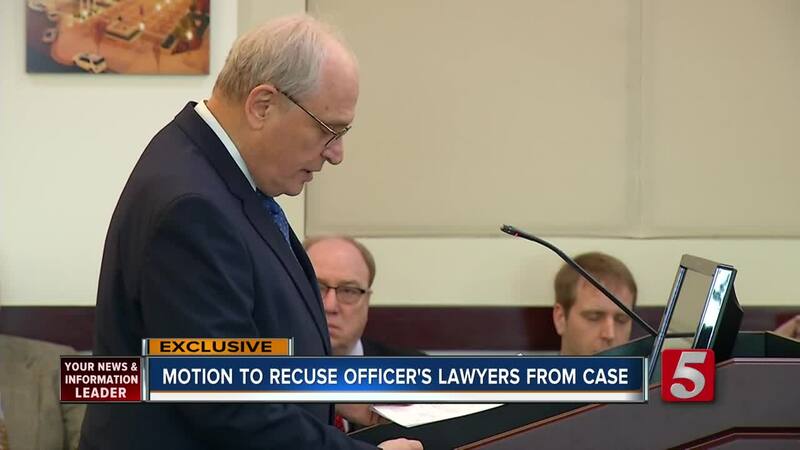 "The conflict of interest would occur if Mr. Raybin represents FOP and they are against a plea and Mr. Delke wants to enter some sort of plea," said legal analyst Jim Todd. Todd says Brown represented several of the Metro officers on scene the day of the shooting - some of whom may now be called at Delke's trial. "Mr. Brown will find himself in a position where he is representing Mr. Delke and is also previously represented the witnesses against Mr. Delke," said Todd. So with potential conflicts what will happen? There's a hearing next Tuesday, and indications are Delke may be called to the stand to be asked if he is okay with these potential conflicts of interest. If he is, he'll be on the record, and the lawyers will likely be allowed to stay on the case.